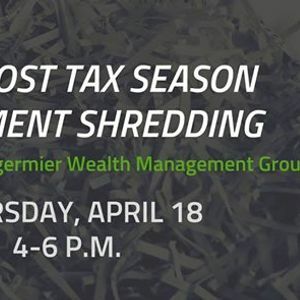 With the end of the 2018 tax season, Egermier Wealth Management Group is sponsoring our annual free document shredding services to friends and family of Skutt Catholic and accepting donations to benefit the Skutt Catholic Alumni Association. 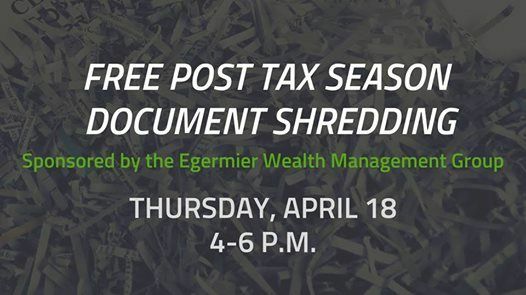 If you have outdated information that you would like destroyed, a shredding truck will be available on April 18, 4-6 PM at 15606 Elm Street (across the street from Skutt Catholic). The first box of documents will be shredded at no charge. For any additional material we request a small donation with 100% of the proceeds given to the Alumni Association to fund future alumni events and scholarships. All items are destroyed on-site where you can watch the document destruction via a closed circuit camera connected to the truck. Some documents to consider are tax returns older than 7 years, old check registers, outdated bank and investment statements or anything that contains your social security number or other sensitive information. We ask that you please limit shredding to personal, non business paperwork in order to allow as many people as possible to take advantage of this service. This is a great way to spring clean while at the same time helping our Alumni Association. We hope to see you there!